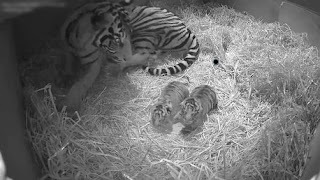 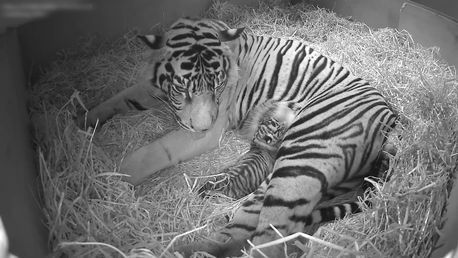 Critically endangered Sumatran tiger gives birth to adorable babies on hidden cubcam at London Zoo - BlogIT with OLIVIA!!! The beautiful moment a critically endangered Sumatran tiger gave birth to two adorable cubs has been caught on a hidden cubcam. Zookeepers were delighted to see seven-year-old tigress Melati and her partner nurturing their strippy babies - who are still yet to open their eyes. 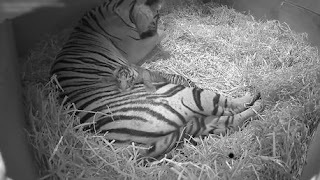 The pregnant tigress was spotted going into labour on a hidden camera and zookeepers watched excitedly as she remained oblivious anyone was watching.